According to Alto Police Department Chief of Police Jeremy Jackson, while they are amazed at the outpouring of support, love and donations they have received, all donation stations within the city are "bursting at the seams." ALTO, Texas — Officials with the city of Alto are asking donations toward residents of Alto halt at this time. 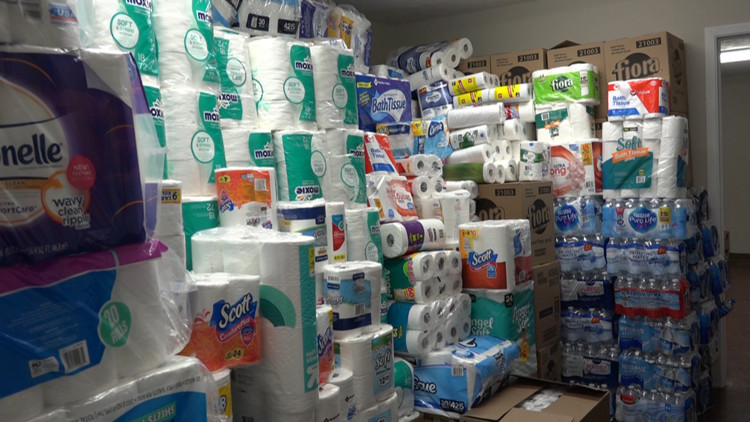 According to Alto Police Department Chief of Police Jeremy Jackson, while they are amazed at the outpouring of support, love and donations they have received, all donation stations within the city are "bursting at the seams. "If there becomes a need for more, we will gladly ask and accept more," Chief Jackson said in a Facebook post. Volunteers at Alto Missionary Baptist Church echoed those sentiments. "Its not that we don’t want donations its just that we need time to get things kind of more organized," volunteer Tommy Grogan said. The back rooms at Alto Missionary Baptist Church are so full they are stacked to the ceilings with supplies. "The stuff we have here you know you can look around and it’s just getting overwhelming," Grogan said. Monetary donations are still being accepted at BancorpSouth in Alto. Meanwhile, Chief Jackson says power has been restored to at least 90% of the city. If customers are still having trouble with their power, they can call 800-666-8154. RELATED: National Weather Service confirms 2 tornadoes in Cherokee Co., 3 in Houston Co.